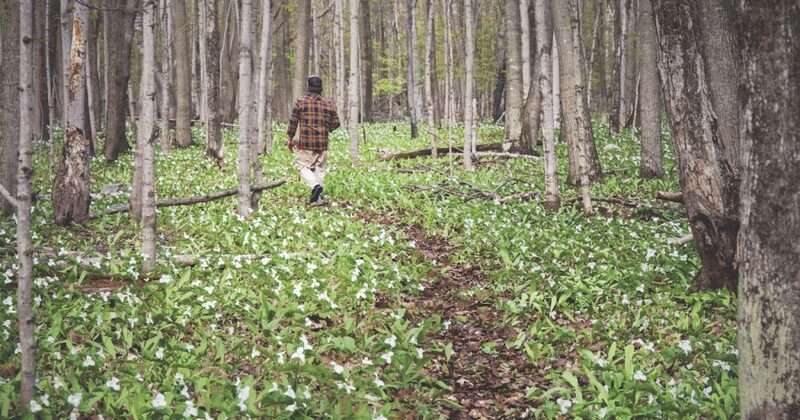 It’s rare that a major conservation project is described as “simple.” And when a 100-acre parcel came up for sale along the scenic Tunnel of Trees, the Little Traverse Conservancy’s Kieran Fleming certainly didn’t think preserving it would be a slam dunk. For one, the land contained some valuable Lake Michigan frontage—and thus a hefty price tag. But when the conservancy showed the property to the Hoogland family, donors who had been searching for just the right parcel to buy and donate to the conservancy, things moved faster than expected. It turned out the land up for sale was just a stone’s throw from a beachfront picnic spot the Hooglands had frequented decades ago. The nostalgia fueled a speedy offer, quick sale, and subsequent donation to the conservancy of all but the cliffside Lake Michigan frontage, which the group preferred not to take for liability reasons. Now, the newly christened Hoogland Family Nature Preserve will forever protect 100 acres of prime forestland, including a half-mile of scenic frontage along M119. It’s officially open to the public now, with a new parking area and trail system. Meanwhile, the Hooglands, who Fleming says aren’t planning on building a house on their part of the property, are enjoying their permanent new picnic spot on Lake Michigan. Directions: From Harbor Springs, drive north on M-119 for 7.7 miles. At the base of the big hill, Wasson’s Grade, you’ll turn a fairly sharp corner to the right and the parking area will be on the right soon after.